At San Francisco 49er home games, Beyonce concerts and international soccer matches, fans in northern California are experiencing Qylur Intelligent Systems and their automated, self-service entry system at Levi’s Stadium, the most technologically advanced and sustainable stadium in the world. The Qylatron Entry Experience Solution combines personalized fan greeting, ticket taking, and bag security screening for staff and guests. This industry-changing security and fan experience development comes on the heels of Qylur’s successful deployment at the 2016 Rio Summer Olympics. The Sports Techie community blog is honored to share this news about the new long-term deployment arrangement the Silicon Valley technology company signed with the state-of-the-art stadium as it scales with checkpoint tech of the future. 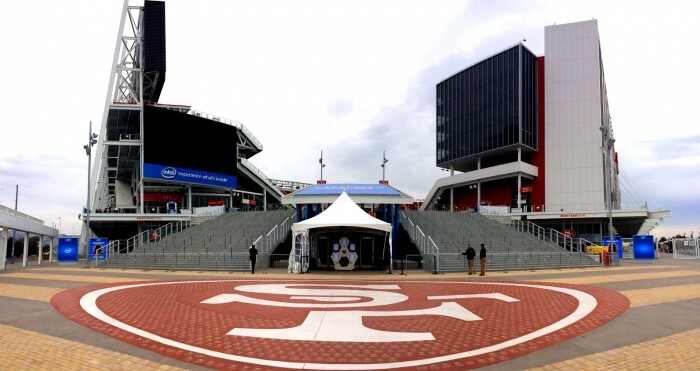 Levi’s Stadium And Rio 2016 Deployment Of Qylatron Entry Experience Solution – SportsTechie blog. The Qylatron in action is automated smart detection like nothing you have experienced before at live sporting events. Hearing from fans here in the U.S. and overseas about their relatively pleasant entry experience via an automated self-service security process for ticket validation and bag screening helps give interested clients an idea about the non-threatening and easy to use technologies that make up this sophisticated product. Qylur offers their Industrial Internet of Things (IIoT) platform technology as a way to change the current image fans dread when attempting to enter most venues. Spectators face long lines, a police and military type atmosphere, and an invasion of personal space that is understandably required to combat modern terrorism and hooliganism. The Qylatron autonomous intelligent system is designed to alleviate the uneasy feeling associated with greetings, ticketing and bag searches through adaptive learning and smart analytics. This process can handle five times the people flow, improve detection of harmful devices such as bombs, liquids, and banned substances that include favorite Napa Valley wine bottles, and a Star Trek type experience designed to counter unsettling emotions that come with scanning tickets and property search. The $1.2 billion venue features 1.85 million square feet and 68,500 seats, including 174 luxury suites and 9,000 club seats. The Bay Area landmark was designed by HNTB and constructed by Turner/Devcon in accordance with the Santa Clara Stadium Authority public joint powers arrangement. Levi’s Stadium is Qylur’s first United States sports venue customer ever since late 2015. 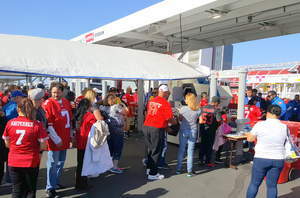 The Levi’s Stadium operations team rolled out of the first Qylatron to test it and to receive feedback from staff and fans. It was primarily operational for stadium tours and was next used for catered events, employee screening, and eventually events such as international games and musical shows. Stadium employees and guests carrying allowed bags were treated to this premium experience. The initial business partnership blossomed into this long-term commercial deployment agreement. The automated, self-service entry kiosk will now be operational at various sport and entertainment events. Qylatron Entry Experience Solution was deployed at the recent Rio 2016 Olympic Games. A commercial deployment of the Qylatron at the 2014 FIFA World Cup™ games in Brazil was met with resounding success. The solution was again deployed at the recent Rio 2016 Olympic Games at the main Olympic Village entry. ISDS, an official sponsor and supplier of product at Rio 2016 Olympics. Future target clients include other stadiums, amusement parks, landmark buildings, transportation hubs, airports, and secure facilities. How many of the Qylatron were deployed at Rio 2016 and at what venues? – Rio 2016 deployed one Qylatron at the main entry to the Olympic Village, which was used by guests, VIPs and athletes. In terms of the Levi’s Stadium new long-term deal, will the the Qylatron be installed at all gates and entry points? – Qylur and Levi’s Stadium are following a gradual adoption plan for the Qylatron at the stadium, a plan that has already grown from day-tours to cover all large-scale events as well as both employees and fans. 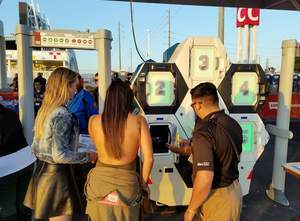 Levi’s® Stadium security-screening technology by Qylur. Sports Techie, the secure private process of ticketing by Qylur at Levi’s Stadium has won over facility management and the fans. Venues are in direct competition with providing an enhanced fan experience with TV and internet streaming because fans are aware of the possible terror of attending games, and because viewing live sports at home or wherever they watch from can involve exciting technologies such as OTT, and features they control such as zoom, selecting different cameras and angles, and on-demand. Your next gameday or matchday, think about the Qylatron because it is your self-entry and security friend.